Economists predict downward pressure on Russia’s currency will boost tax revenues and provide a fillip to carmakers and local vendors. This time, oil exporters will miss the party. Russia’s falling ruble may provide a boon for government coffers and a bonanza for the nation’s car industry and other vendors, prompting Russians to buy local as the currency descends to its lowest level against the dollar in four years. A host of factors have combined to push the ruble down, from fears about the end of quantitative easing by the U.S. Federal Reserve to statements by Russian Finance Minister Anton Siluanov that a weaker ruble would have economic benefits for Russia. Sluggish performance in the European Union, Russia’s largest trading partner, and less-than-rosy forecasts for GDP growth have also had an effect. But unlike the historic ruble devaluation of 1998, when Russia’s oil companies booked windfall ruble profits by selling crude in dollars, new tax rules mean the state will collect most of the surplus oil profits this time. Domestic firms that target the Russian shopper, on the other hand, should get a lift, as Made in Russia becomes more competitive. “The costs of imported goods will increase, and one of the biggest winners will be Russia’s burgeoning auto industry,” said Chris Weafer, founding partner of Moscow-based Macro Advisory. “Russia’s auto market will soon overtake Germany to become the largest in Europe.” Carmakers that may benefit include local giants VAZ, GAZ and Sollers. In some ways, Russia has seen this movie before. Facing a host of macroeconomic headwinds, depleted foreign exchange reserves and fallout from an Asian economic crisis, Russia devalued its currency in 1998, sending the ruble spiralling from 6 to the dollar to nearly 30 per dollar over the course of a few months. Today’s slide isn’t nearly so severe. At the start of 2013, the ruble traded around 30 to the dollar. Today it trades around 33 per dollar, though some economists predict the currency may sink to as low as 37 per dollar by year’s end, especially if the price of oil, Russia’s main export, falls. The ruble is only partly free-floating. The currency is allowed to trade within a range against a dollar-euro basket set by the Central Bank of Russia, which has spent $11 billion propping up the currency since this spring as it allowed the band to slip, according to Bloomberg. Russian policymakers aim to allow the currency to float freely by 2015. Tax receipts from oil exports provide a buttress to Russian sovereign debt, Weafer said, creating a possible opportunity for yield-hungry investors looking for fixed income with low risk. “Russia is very comfortable in terms of debt servicing and won’t have to borrow to balance its budget. The Russia28 Eurobond is currently yielding 5.6 percent, while the Russia30 is at 4.3 percent. Those are priced in euros – so there’s no currency risk – and the yield is reflecting a budget risk that’s not really there,” said Weafer. 143 Million Russians Buying Local? The falling ruble should provide local vendors a hand in capturing the Russian consumer, a group that is increasingly targeted by global retailers as rising incomes boost purchasing power in Europe's largest country by population. A recent World Bank study ranked Russia as Europe’s largest economy, and the world’s fifth-largest in terms of purchasing power parity. “Nowadays, the disposable income of the average Muscovite exceeds that of the average Houstonian,” said Edward Verona, former President of the US-Russia Business Council. Rising incomes are due to “a decade of buoyant economic growth, a low, flat income tax rate, social benefits provided by the Russian government and, perhaps most importantly, the fact that the average Russian owns his or her home and doesn’t have a mortgage,” Verona said. “Russians have a lot more money to spend on consumer goods and they are eager to catch up after seven decades under communism and a difficult transition to a market economy,” Weafer said. Magnit has been “propelled to the top of Russia’s food-retail industry, a fast-growing, $300-billion-a-year market that is now Europe’s largest,” the Economist magazine wrote earlier this year. By early this summer, Magnit’s share price had already doubled over the previous 12 months after the company posted a record $4.3 billion in quarterly sales. And what of Russia’s now-inexpensive exports? “A Russian company called VSMPO-AVISMO is Boeing and Airbus’ largest supplier of titanium. The aircraft manufacturers are doing great now that they are getting that input cheaper. This price of the 787 will go down,” said Weafer. 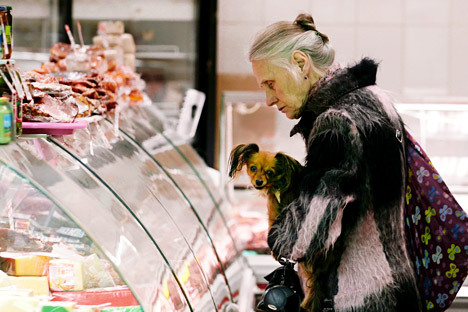 The weaker ruble also means Russia’s food exports to the United States – like caviar and crab legs (valued at $175 million in 2012, according to the U.S. Census Bureau) – will be comparatively cheaper. “This could be a great time to buy a diamond for that special someone,” concluded Weafer.